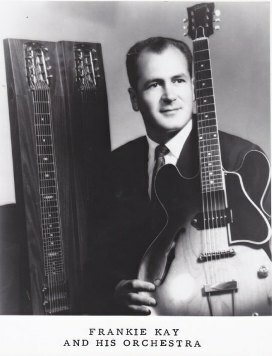 Frank Kuebelbeck was born before the first electric guitar was ever made, in 1930. By the time he was in high school, Frankie Kay (as he would become known) was already a bandleader in his native Kansas City, Kansas, playing steel guitar. In 1951, he was a studio musician at KCMO radio, playing morning shows and then playing 6 nights a week in the clubs, when he was offered the opportunity to join Cowboy Copas’ band in Nashville. Curly Chalker is another musician Frank befriended and hired when he was in need of work. Curly was once asked if he knew Frankie and Curly’s reply was, “Frankie Kay is one of the best steel players in the world.” Of course, Frankie says it’s not true. “I became friends with Curly just out of pure guts. I knew that guy had some talent that I’d never ever seen. So I went up and introduced myself and he tolerated me. 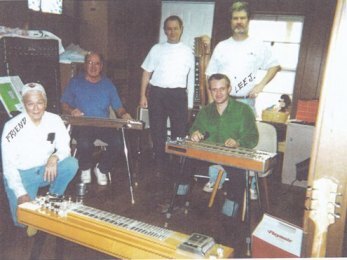 Next thing you’d know, he’d play himself out of a job and he’d call me up and I’d help him try to find another job.” Phil Sperbeck, pedal steel player, was a protégé of Frankie’s. Phil went on to play with Bob Wills. Frank, you are man after my own heart! From one chord man to another, I hope I’m still swingin’ at 81 years old like you are! Mike: You hail from the home of so many wonderful Jazz musicians through its history, such as Lester Young, Coleman Hawkins, Ben Webster, Count Basie–just so many wonderful musicians…. Frankie: Yardbird! He was a Kansas City, Kansas guy! MN: Who was the one who really caught your ear the most when you first got hip to Jazz? Was it Charlie Parker? MN: When you first heard it you must have been like the rest of us who just can’t help but wonder, “What the heck are they doing?” Harmonically, it’s just so different, a whole other language—it’s a mystery. FK: I know it—I did. I would just grasp bits and pieces of it. Another thing, Mike, I was lucky that I always had a good jazz piano man in my Western Swing band. I stood right next to the piano and I really gleaned a lot of the chord formations from him, especially if he was on top of things. 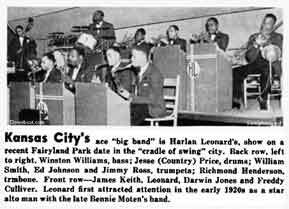 We had a lot of good jazz men that just weren’t doing anything in my early days in Kansas City and I, being a leader, I was fortunate that I could hire who I wanted. Even though I might have a Western Swing band or a Country type, if I had piano player who was a jazz player, he could play anything. MN: I guess that’s the way that the jazz language crept its way into Western Swing—because they would hire players with that harmonic knowledge and they would bring that kind of stuff to the Western Swing. FK: Absolutely. Like Tommy Morrell and all of the players he played with—they’re all jazz players with cowboy suits on. MN: Right. But I mean you can even hear it in the earliest recordings—little elements of jazz finding their way into the music little by little. MN: When you looked at the piano player, you could actually look at his hands and see what he played? Do you play a little bit of piano? FK: No, I’m not a piano player—I wish I were. In those days, in the ‘50s and ‘60s, we only had one microphone on the bandstand. It was really primitive. I would just be close enough where I’d hear all those nice chords that he was playing. I couldn’t play them, but I could substitute maybe 2 notes out of the chord, or 3 if I was lucky. MN: I remember Lee Jeffriess telling me that you had a piano player who studied with Dodo Marmaroso and he was helping you out with some of the voicings and things like that? FK: Yeah, he was very patient with me and he showed me voicings and substitutions and he told me, “You don’t have to have 3, 4 or 5 notes to make a chord. As long as you get the voicings right in your lower register…” I play a lot of 2 string things. I love the last 5 strings on my E13 tuning. I’m not one of those steel players who play with the first 4 strings and never utilize the bass strings. MN: I think we have a lot in common! I’m really into playing chords and rhythm stuff on the steel guitar and focusing on the lower register. FK: Yeah, I focused on playing in the lower register. My tuning is actually E13 tuning, but there are at least 4 different E13 set ups. MN: What are the notes in yours? FK: The first string is E, C#, B, G#, F#, D, G# and E.
FK: No, and by doing that a lot of times I can start off…I’m hooked up and I’m sitting by my steel—would there be any problem of me showing you what it sounds like? MN: Oh, it would be fantastic! MN: Yes, I did. It sounds similar to the way I like to approach it—you have the 10th interval between the low G and the B and then you played Ami7, Bmi7, Cmi7, Bmi7, Bbdim, Ami7, Ab7. Excellent. Rhythmically do you like a Red Garland comping rhythm or anything like that? FK: Yes I do. The way I got to comping was I had a piano, guitar, bass, drums and me. When I didn’t have the piano player, I started playing the piano part behind the lead guitar player. I’ll play you a few bars of that if you’d like…. FK: I stay in the same key—I like the lower keys and I’m not one to play up above the 17th fret. It hurts my ears [laughs]. It’s a matter of personal taste…. MN: And it’s a little hard to navigate up there, too. FK: No kidding! I’m happy to hear that there’s somebody else out there that feels the way I do about it. That’s great. MN: A lot of guys don’t realize how simple it is to change just one note, for instance, in the C6 tuning making the lower C a C#–sure, you lose the root down below, but you gain so much. In thinking chordally, it’s a no-brainer. FK: The reason I’ve stuck with this E13 the way I have it, I can get a straight chord: a 6th, a 7th, a 9th, a 3 string diminished and I can get a 3 string augmented with a reverse slant. Then, when I need it I can throw in a 2 note b5 (tritone). It’s what you get used to. MN: You play a double-neck Stringmaster, right? What other tuning do you use? FK: Yeah, I have a double-neck, but I’ve had 4 necks, 3 necks and then I came down to a double. At one time I had a combo with a guitar player who had a double neck with bass on one and lead guitar. And so on my triple neck I had 3 tunings: the E13, probably an A6 or C6 and then I had bass strings that I bought and I doubled on bass when he was playing lead guitar. A year ago I went to Joaquin Murphey’s tuning on my second neck and it was C6 with an A9 on the last 4 strings. MN: So you had the B two octaves higher for string 8? FK: Yeah, that’s it, but it didn’t please me; it was too shrill. So I dropped it down to a Bb6 with a G9 on the last 4 strings. It sounds good, but I’m really not at home on it. I’ve had it on for a year and I’m still learning. It’s an experimental neck and I just play with it for fun. MN: Where did you hear about that tuning? MN: That’s what they say was Joaquin’s tuning. I can hear a few different tunings that he used in different periods. One of my favorites is the one he used on Spade Cooley’s “Dance-A-Rama”. It was a 10” record with maybe 6 or 8 songs on it. His playing is out of this world on that one—he started to play more chords. He really ripped up the single note stuff, too, but he played more chords and added some more altered sounds. He played with a C6 (high G), but he raised the low C to C# and the low A to A#. That recording signifies a big change in his playing. FK: Yeah, he was growing up, musically. Oh boy, I knew there was a lot more to steel when I heard him playing. [laughs] As a teenager, I heard him playing on the west coast. MN: Well, one of the common threads between most of the great players is that they got hip to jazz. I think once those colors are available to you as a painter, you can’t paint a painting without them. As soon as you hear those chord qualities, you become drawn to it. Curly Chalker had those sensibilities, too. FK: He was astounding. I heard him so much growing up and then he worked with me a time or two, although I had to use him on bass because I was playing steel. He didn’t give a damn! He wanted to work, he was hungry. MN: Yes, I’ve heard similar things about both those guys. Neither one of them suffered any fools gladly. But like you said, there was a lot going on upstairs. Curly, as most people know, didn’t have too many kind words for other players, but apparently he did for you…. MN: I’m sure that your kindness went a long way with him. FK: First time I met Curly I was 19 and he was playing the straight steel then. He developed into a pedal steel player in his 20s, late 20s. MN: Did he have all that harmonic sense together back then? FK: Oh yeah, he was a helluva straight steeler. Tommy Morrell said that he was the best non-pedal steel player in the world. 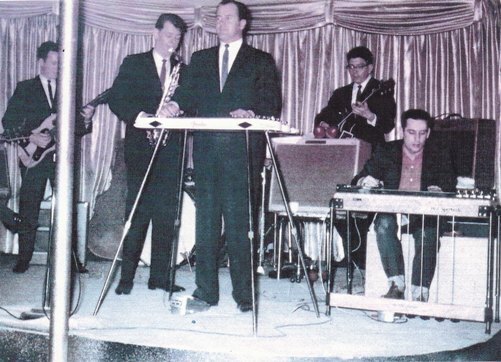 Curly Chalker, left, on bass, Frankie, center on non-pedal steel, Phil Spurbeck, right, pedal steel. MN: You told me Tommy Morrell was your idol…. FK: He’s my idol, 100%. MN: When you listen to Tommy, at times it feels like he’s opening up so many other layers of his playing—he was a deep player…. FK: One of the things I really like about Tommy Morrell is that he didn’t play a thousand notes per second; he played what I could hear and understand. Some of these guys that are rally hot Nahsville players, they just play [emulates machine gun sound]. I can’t get anything out of it. MN: I can go either way with that, as long as I feel that, whatever the person is playing, it’s part of what they are trying to say and not just gratuitous. MN: Did you start playing guitar first? FK: I started playing steel, but I wish I would have started on guitar, to tell you the truth. If I started on guitar, though, I may have never gone to steel—that’s a possibility. I had a guitar studio for 40 years and I taught regular guitar. Anyway, I played a job one night with a jazz snob over in Kansas City, MO and he was a saxophone player. He said, “Which guitar you gonna play tonight: the steel or the real?” [laughs] That pissed me off—I never hired him again. I started playing steel when I was 10 years of age. 60 steel guitar lessons, you get a free wooden guitar. I was the dunce of the class—really, I didn’t take to it too readily. But my Dad was persistent and he enrolled me in private lessons. When I was about 13, I started my own group and I had old guys playing with me. MN: This is right around WWII. Were you playing any Hawaiian music? FK: Yeah, I played some Hawaiian stuff, some Cowboy stuff. I was lucky—one of my teachers taught all of those good swing tunes, Sweet Sue, All Of Me—the good old tunes. MN: Were able to tune a lot of that Hawaiian stuff in on the radio? FK: Oh yeah, and Alvino Rey, I liked him. He was playing the homemade pedal steel and I loved it. Boy, he was a chord artist. And he had a helluva big band. I liked him and then I gravitated into the west coast players and all that. MN: How old were you when you moved to Nashville? FK: Let’s see, I was about 19 when I started playing 6 nights a week. I was working at an insurance agency when I got out of high school. I didn’t want to get a job, but my Mom took me around for interviews and all that. I was an office boy at the insurance agency and I was also playing 6 nights a week making $90/wk as the leader of a 4 piece band in a nightclub. I had to have a special permit because of my age. One of my good buddies in Nashville was Hank Garland. He kind of moved toward the jazz direction, too. He used to be lead guitar player for Cowboy Copas before I got there. Copas always had a good, hot band. MN: Who was your favorite steel player then? FK: Leon McAuliffe was my idol at that time. Besides Leon’s steel playing, he had a helluva good band, the Cimarron Boys. I loved his orchestrations and everything. He was a really early steel guitar player playing hot stuff. MN: He was a very exciting player, doing it before Speedy and those guys came along. I think he gets overlooked a little bit in that regard. FK: I think he did, too. Boy, those people in Tulsa, OK—when Leon would go on the road, I had a Western Swing band at the Riverside Rancho in Riverside, which is a suburb of Kansas City, and he would call me before his road date and I’d go to Tulsa and play for him while he was on the road. If you had a steel guitar in the band in Tulsa, you were set. And I played all of Leon’s stuff, I aped him and loved all of his songs. He had a wonderful place called the Cimarron Ballroom. It was an old opera theater and they transformed it into a Western swing ballroom. Those people in Oklahoma and Texas really know how to dance. MN: It seems you really have taken good care of yourself—you have a great memory…. FK: No, I didn’t, I was just like all the other wild asses around. I’ve got good genes apparently. I’m 81 and I’ve been married to the same wife for 59 years. MN: You don’t hear about 60th anniversaries too often…. MN: She must have an element of saintliness in her. FK: Well, that and she is powerful, let’s put it that way! She knew I was in the music business when I met her and she tolerated it. MN: Do you like to improvise when you play? FK: I’m an improvising son-of-a-gun, but when you get away from the melody, you might as well pack up and go home. I like to start off with the melody, like Morrell did, but I’m not satisfied, I like to improvise all the time. MN: Do you have a certain approach to improvising? FK: I think I play off of the chord changes more than I do the melody. I really don’t like to play the same ad lib every time; I like to expound and play beyond. I like to play something different. MN: Well, Jazz is music of the moment, you know—it’s spontaneous composition. Do you find it hard to find other players coming from the same place? FK: It cramps my style when I’m playing a 3 chord blues and I start to wander off and throw the other guys. That’s pretty bad. My favorite player on earth is the bass man. If I’ve got a good bass man, I don’t need anybody else. How about you? MN: Yeah, I’d have to agree. I think you can have a steel guitar trio—bass, drums and steel—and it would work great. One of my personal dream situations would be to play steel in an organ trio, just steel, drums and organ player—someone who played the bass pedals. FK: Oh, yeah, that would be great. B3 organ? I never even thought about that. MN: Frank, I really appreciate every moment that you spent talking with me. It’s quite an honor. FK: Well, I’ve enjoyed talking to you—you talk the lingo I understand, as the song goes. Special thanks to Lee Jeffriess, Russ Wever and Nancy Kuebelbeck.